NYC F.C. is having turf problems again, as large chunks of the temporary sod covering New Yankee Stadium’s dirt infield were peeling up at their home match last Saturday. There’s still been no announced progress on the latest stadium plan proposed last summer (which wasn’t even proposed by the team, but by a private developer), and I honestly won’t be surprised if there never is, though Yankees president Randy Levine did say recently that he “hopes” to have a soccer stadium announcement this year sometime, so there’s that. Deadspin ran a long article on why Quebec City keeps getting snubbed for an NHL franchise, and the short answer appears to be: It’s a small city, the Canadian dollar is weak, Gary Bettman loves trying to expand hockey into unlikely U.S. markets, and Montreal Canadiens owner Geoff Molson hates prospective Quebec Nordiques owner Pierre Karl Péladeau, for reasons having to do with everything from arena competition to Anglophone-Francophone beef. Say it with me now: Building arenas on spec is a no good, very bad idea. Inglewood residents are afraid that the new Los Angeles Rams stadium will price them out of their neighborhood; the good news for them is that all economic evidence is that the stadium probably won’t do much to accelerate gentrification, while the bad news is that gentrification is probably coming for them stadium or not. The it-could-be-worse news is that Inglewood residents are still better off than Cincinnati residents who, after F.C. Cincinnati‘s owners promised no one would be displaced for their new stadium, went around buying up buildings around the new stadium and forcing residents to relocate, because that’s not technically “for” the new stadium, right? Worcester still hasn’t gotten around to buying up all the property for the Triple-A Red Sox‘ new stadium set to open in 2021, and with construction set to begin in July, this could be setting the stage for the city to either have to overpay for the land or have to engage in a protracted eminent domain proceeding that could delay the stadium’s opening. It’s probably too soon to be anticipating another minor-league baseball road team, but who am I kidding, it’s never too soon to look forward to that. MLS commissioner Don Garber is still beating the drum for two more expansion teams to get to a total of 28, and mentioned seven cities — Detroit, San Diego, Cincinnati, St. Louis, Charlotte, Las Vegas, and Phoenix — as possibilities, notwithstanding that Cincinnati was already picked for an expansion franchise earlier this year. Cut the man some slack, it’s gotta be hard to keep track of all the cities that do and don’t have MLS franchises yet. Maybe he could get someone to make him an app. Detroit, like a lot of cities, is giving tax breaks and other subsidies to lots of projects, not just sports, and the evidence is that most of these are wasted on development that would happen anyway. Which isn’t new news, but in case you needed the reminder. A $1.5 billion redevelopment of the parking lots around the Nassau Coliseum is seeking $100 million in New York state grants, despite concerns that building a $1.5 billion mixed-use development in what’s kind of the middle of nowhere without a major-league team playing there is kind of a crazy idea. And speaking of development near New York sports venues, the Willets Point area in Queens — which visitors to Mets games may remember as a hive of auto repair shops, and more recently as a barren wasteland where a hive of auto repair shops used to be — may end up getting partly used as parking lots for the foreseeable future, which has people whose businesses were forcibly displaced for what was supposed to be new development kinda steamed. The Mobile BayBears are moving to Huntsville — as I’m sure you know, right? — and the city’s terrible lease on their 22-year-old stadium means the landowner could tear it down if the city doesn’t find a new team to move in. Don’t put all your development eggs in the basket of minor-league sports, kids, and if you do, for god’s sake get some grownups to write the lease. Yldefonso Solá Morales Stadium, home of the Caribbean World Series champion Caguas Criollos of the Puerto Rican league, is facing demolition from Hurricane Maria damage because the city can’t spare $15 million to repair it. Not that Caguas should be taking money from all its other desperate needs to fix a baseball stadium, but it does drive home the craziness of Puerto Rico’s economic situation when a stadium will get torn down for the lack of less money than Dustin Pedroia was paid by the Boston Red Sox to play three games this year. Construction News has a long article about how Tottenham Hotspur‘s new stadium might not open at all this year thanks to organizational disarray and workers snorting coke on the job; it’s worth a full read, but if you just want the short version, Deadspin has an excellent summary with a great headline and your clicks help pay me for future articles for them, so sure, go there! With no fan footprint in Los Angeles (and many San Diego-based fans feeling abandoned by the move), the 27,000-seat StubHub Center has doubled as an extra home game for visiting teams. The Eagles famously had 80 percent of the stadium last year, and it was more of the same when the Kansas City Chiefs came to town for Week 1. As USA Today notes, this is in the 27,000-seat Stubhub Center; when the Chargers move to their new 70,000-seat stadium next year the year after next, they’re either going to end up with even more visiting fans, or with a ton of visiting fans and a ton of empty seats, which would be even worse. Or maybe, just maybe, there are lots of Chargers fans out there just biding their time until they can see football in a giant modern football stadium instead of in an intimate modern soccer stadium, and … yeah, I’m not seeing it either. The Rams have their home opener on Sunday, against the Arizona Cardinals, which would seem to be ripe for visiting fans making the jaunt from one state over to visit the L.A. Coliseum. I’ll be watching, by which I mean watching Twitter, because even the prospect of a carpetbagging team owner being embarrassed by poor turnout isn’t enough to make me watch the NFL. The Atlanta Hawks are now offering a “virtual tour” of the suites at their new arena, which team CEO Steve Koonin describes thusly: “It’s going to be a social place unlike anywhere else in the NBA. All of our research told us that people don’t want to sit down in a chair eating a hot dog out of aluminum foil and watch a game. They want a great night out. … Think Vegas pool meets sporting event.” Add another data point to the growing evidence that sports teams don’t want their fans to come to watch the game anymore, probably because they know that half the time your team’s games aren’t worth watching. Syracuse University is going to spend $118 million to, among other things, replace its stadium’s air-supported fabric roof with a non-air-supported fabric roof, as well as adding “the Wi-Fi.” Syracuse athletic director John Wildhack, according to Syracuse.com, noted that “there has been no money from the state or county promised at this point but indicated the school will continue to explore its options.” At least Syracuse Mayor Stephanie Miner managed to head off building a new stadium for the private university with public dollars, but still, watch your wallets, New York taxpayers. A part-owner of the Pittsburgh Steelers is buying the Carolina Panthers for an NFL record $2.2 billion, and the city of Charlotte has set aside $75 million in public money for stadium renovations for the new rich guy in town, on top of the $87.5 million the city gave the team for renovations five years ago. This undoubtedly helps make the Panthers worth $2.2 billion, which raises the question of whether Charlotte city subsidies are just helping to enrich a serial workplace sexual harasser. David Beckham’s Miami soccer stadium proposal has missed its window for an August public referendum vote and now will have to wait for November at the earliest, because of course it has. The $5 billion price tag for the Los Angeles Rams stadium development project has a bit more of a breakdown now, with Sports Business Journal reporting that the stadium and an accompanying 6,000-seat amphitheater alone will cost $4.25 billion to build. I still don’t get how Stan Kroenke expects to turn a profit, but at least it’s his money he’s throwing at this thing. If you live in Portland, Oregon and want to be part of a focus group about a potential new MLB stadium there, sign up here. Today NFL team owners will vote to increase the debt limit for the Rams new stadium, which according to internal league documents is now projected to cost an amazing $4.963 billion. That would be amazing, yes! Especially since the old record for a stadium cost is the new New York Yankees stadium (around $2 billion), and the last previous estimate for the Los Angeles Rams stadium (which will also be home to the Chargers) was $2.6 billion. What gives? It’s the projected cost of part of the development around it, too. “Part of”? Which part of? 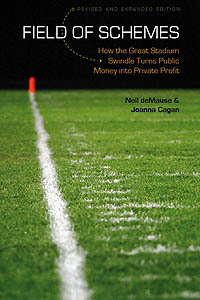 And why is the NFL concerning itself with debt limits for an ancillary real-estate project that isn’t about football? For now, all we know is that Stan Kroenke’s Inglewood stadium complex is going to cost him a buttload of money, and we still don’t know how he plans to make it all pay off. Which is his problem, since he’s not asking for public money, but still, inquiring minds would like to know. The Los Angeles Rams and Chargers have announced the impending start of personal seat license sales for their new stadium when it opens in 2020, which is always a fun moment because it lets you see how much teams think their fans will put up with paying just for the right to pay more money on top of that for actual tickets. So what do these two teams that have had trouble drawing flies at their temporary digs think Los Angelenos will spend to see games at their new one? For the Rams, PSLs will start at $1,000 for the cheap seats, and go up to $100,000 for the priciest ones. For the Chargers, PSLs will start at “we’re not saying yet, we don’t want to frighten off anyone who might actually consider themselves a Los Angeles Chargers fan” and run to a maximum of $75,000. The Los Angeles Times describes these particular seat licenses as “an NFL first,” since it’s more a long-term low-interest loan than an actual purchase: After 50 years, the price will be repaid to whoever holds the PSL at that point. In practice, this isn’t much different from an outright purchase — if I’m using this present value calculator right, $100,000 in 2068 dollars is worth about $8,700 in money today, meaning it will cost the Rams and Chargers pennies on the dollar to “repay” the license fees shortly after first contact with the Vulcans. I’m not entirely sure why they’re going this route — marketing ploy or tax dodge are my two best guesses — but it’s not a significant departure from the traditional PSL route. If nothing else, I’m glad to see that the L.A. stadium clubs will feature seating that is a full yard wide, to accommodate Americans’ growing rumps. Truly state of the art. United Airlines is spending $69 million on naming rights to the Los Angeles Coliseum in advance of the 2028 Olympics, but IOC rules prohibit corporate names during the Olympics, oops. Hope you enjoy the most expensive college-football naming rights deal in history, United! Hotel revenue fell 16% in San Diego last year after the Chargers left town, but went up 0.2% in St. Louis after the Rams left. I’m not honestly sure what if anything this means — you’d really have to look at hotel revenue on football weekends to do this right, and it doesn’t look like this study did — but feel free to speculate wildly. Did I mention the Yahoo Finance article yet that compares the Amazon HQ2 chase to the competition to host the Super Bowl, and cites me saying that while Amazon will bring more jobs, “that said, there’s almost no way it’s worth the kind of money that cities are talking about”? Well, now I have, enjoy! AL.com has recalculated the public costs of a proposed University of Alabama-Birmingham football stadium and come up with a total of $18.2 million a year — $10.7 million from a bunch of county taxes, $3.5 million from a new car rental tax surcharge, $1 million from other county funds, and $3 million from city funds — not the $15.7 million I had previously reported. UAB and a naming rights sponsor and other private contributors, meanwhile, would only put in $4 million a year, and only for the first ten years. Out of his goddamn mind, I tell you. Norman Oder of Atlantic Yards Report filed a Freedom of Information Law request to see the competing bids for the Belmont Park site that eventually got awarded to the New York Islanders, and was shot down on the grounds that it would “impair present or imminent contract awards.” Wait, wasn’t the contract already awarded? Will it be okay to ask again once it’s too late to do anything about it? A New Orleans Pelicans game was delayed because the arena roof leaked. No one is demanding that a new arena be built just yet that I’ve heard, but given that the current one is 19 whole years old, it’s gotta to be a matter of time, even if this one does have a fire fountain. The Pittsburgh Pirates are threatening to sue the city-county sports authority over who’ll pay how much for $10 million in improvements to their stadium, because apparently the people who write these stadium leases are idiots. If you enjoy this site but were thinking, “Wouldn’t this be better as a YouTube video with lots of animated charts?”, Vox has got you covered. The Houston city council has approved spending $3.2 million in tax dollars on a pro rugby stadium for the Houston SaberCats, who are a pro rugby team that is going to play in a pro rugby league, which councilmember Jack Christie calls “a beautiful example of public-private partnerships that we ought to look at in the future, because as far as I have heard, there’s not been one city tax dollar used for this development.” I’m done. Have a good weekend.